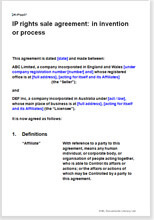 This is an agreement for the sale of rights in an invention or improvement, or in any software or technical product. It may be an innovative new product for sale or a device to improve an existing product. The product could be a software game or designs for a railway bridge or any other invention. We assume the buyer requires full control so that he can brand and market it as his own. Option for seller to licence supporting intellectual property. This is a heavy weight agreement for sale of rights to an invention or technological innovation. You may be an individual or represent a company. Your work may be applicable in one industry or many. It could be anything. You want to sell all rights to a major manufacturer. Sale limited to a particular market or industry. You probably intend to sell rights for use in other industries or to manufacture it for your own use in your industry. We have named the subject of this product “Excalibur”. You can rename it or give it an abstract legal name like “Licensed Product”. Example of use 1: writer of software game for WXYZ-Box sells game to console maker. Writer has licences from third parties for software and graphics incorporated in the game, so he cannot sell what he does not own. Those elements must therefore be sub-licensed. Writer has also invented and written a number of special ways to make animals and people move. He wants to keep those and give only a licence, so that he can use them in future games. Example 2: a writer of social network software system sells it to BigCo plc to exploit. Writer has also invented clever way for users to communicate. He wants to keep that and give only a licence, so that he can use it in other applications. Example 3: defence systems supplier sells navigation systemfor unmanned aerial vehicle to manufacturer and licenses certain parts of the platform which it must retain or which it licenses from a third party. Your product or device or invention relies to some extent on a support system, no matter large or small, which you use in other applications or which you intend to keep for other uses or maybe in common with licensees in other industries. That requires a licence because you cannot sell it outright. Maybe you will upgrade it from time to time. The agreement provides for that limited licence. Terms are suggested, so that you can refine them. The second reason is that you may not own all the supporting material. You may yourself use some IP which he has licensed to you from others. The best he can do with that IP is to make sure you are allowed to sub-license it, then do just that. This agreement covers whatever intellectual property rights you decide to sell. The description and specification is up you to agree with the buyer. It provides for a single and final payment. Once sold, the buyer can do what he likes with your invention or computer game. This agreement provides the complete legal framework for what may appear to be a complicated deal. The Net Lawman modular structure in plain English takes you smoothly through the detail of a document of nearly 5,000 words. Net Lawman offers around 20 licence agreements and assignments relating to intellectual property in addition to those in website terms and conditions.